Summary: Unless you are really into dry philosophy books, skip this one. It has little to offer game designers. I picked up Finite and Infinite Games based on a GDC talk of the same name by Richard Lemarchand. I’ve seen others outside of games comment on how the book changed their life, and know that it was steeped in games terminology, so I felt it would be an interesting read. I hoped to gain insight into games from the perspective of a theologian and philosopher but came away very disappointed. 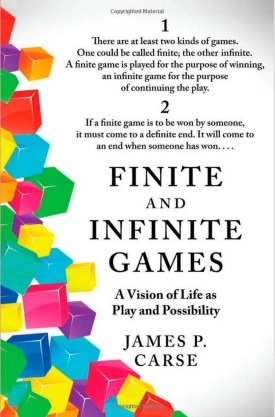 Finite and Infinite Games is a book on social philosophy. The author defines finite games as the structures in our life – societies, nations, war, dating, careers – that have a clear beginning and end, willing participants, boundaries, opponents, winners and losers, and competition for titles or possessions. As you can tell, the book borrows heavily from games terminology to describe our lives and offers the idea that the way we live, as social humans, mimics that of a game. This is in contrast to ‘infinite games’ which Carse describes as games played with the intention of continuing play (rather than ending it to declare a winner). These infinite games swap boundaries for horizons – in games terms, that would mean finite games play within a defined magic circle while infinite games seek to expand that circle. As a part of social philosophy, Carse describes infinite gamers as people who think beyond the artificial constructs of our lives (nations, societies, possessions, etc.) and recognize that most of social hierarchy is a form of play (drama, performance, roles). This sort of semantic structure full of nearly contradictory statements makes Finite and Infinite Games a difficult book to follow, even when it has something astounding and insightful to offer. Structurally, the book is organized into five parts, but I found these divisions kind of arbitrary. More importantly, all the content in the book is organized into short essays (one-half to two pages in length) that cover a complete thought, totaling 100 discrete philosophical statements. This honestly helps quite a bit with reading comprehension despite the dense, dry, abstract philosophical content. I have trouble reviewing this book mainly because I can see it have value to those interested in philosophy, but I felt the content was too abstract, too separate from my lived experiences to actually draw any practical knowledge from them. If you are someone who adores theory, then perhaps you will enjoy this book more than I did. I can’t really recommend it, and certainly wouldn’t include it on any reading lists directed towards game developers.